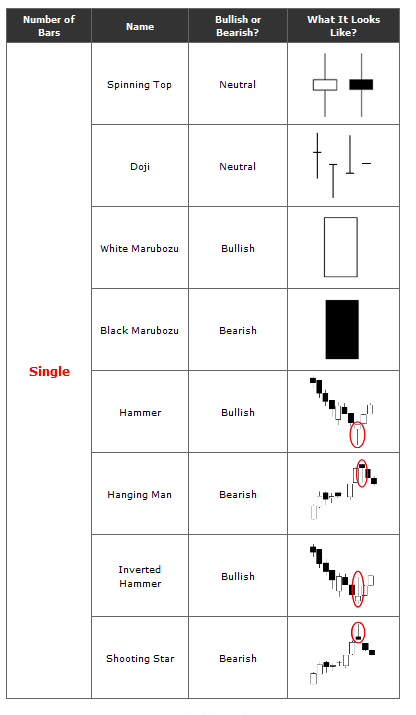 Here’s a comprehensive list of the most common used candlestick patterns in forex trading. The most popular patterns are: Spinning Top, Doji, Hammer (Pin Bar), Shooting Star, Morning Star, Three White Soldiers, Dark Cloud Cover and Evening Doji Star. Download the Forex Candlestick Patterns Metatrader 4 indicator. As the name suggests, single candlestick patterns consist of only 1 candlestick. They can be either bullish, bearish or neutral. All of the reversal patterns shown below consist of two or more candlesticks.